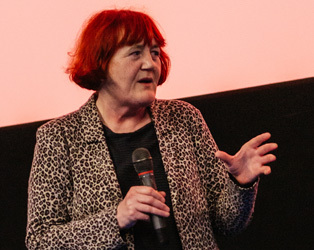 ﻿ Irish Film Institute -CELEBRATING CHINESE PUZZLE AT THE IFI, WE HAVE 3 DVDS + A POSTER TO GIVE AWAY! 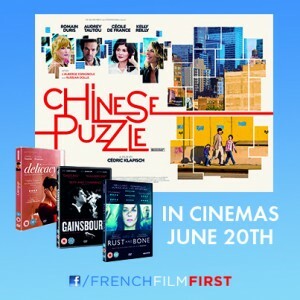 CELEBRATING CHINESE PUZZLE AT THE IFI, WE HAVE 3 DVDS + A POSTER TO GIVE AWAY! 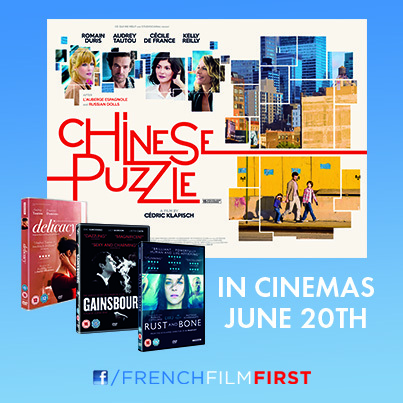 Celebrating the release of the film Chinese Puzzle directed by Cédric Klapisch, opening EXCLUSIVELY at the IFI on Friday, June 20th, we have a fantastic prize bundle from our friends at Studio Canal to give away! 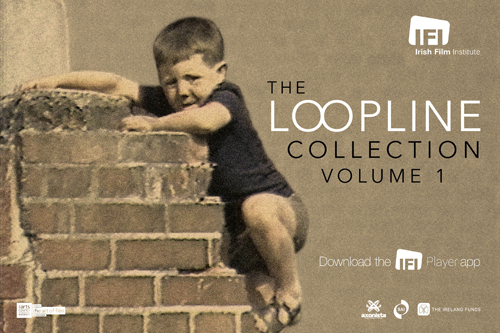 The bundle includes: three French DVDs (Rust and Bone, Gainsbourg and Delicacy) and a film poster. Following the huge box office successes of both L’Auberge Espagnole (2002) and its sequel Russian Dolls (2005), writer and director Cédric Klapisch completes his trilogy with this jaunty final chapter on the lives of Romain Duris’ amiable Xavier and his cosmopolitan friends. After the break-up of his marriage to Wendy (Calvary’s Kelly Reilly), Xavier leaves Paris to follow her to New York where she has moved with their two young children to join her new and ultra-laid-back American boyfriend. 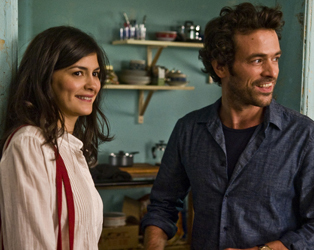 Juggling single fatherhood with attempts to write a novel, find a place to live and (fraudulently) secure a visa, Xavier also manages to get reacquainted with old flame Martine (Audrey Tautou) . . . but not without several arduous diversions along the way. Much like its predecessors, Chinese Puzzle is fast-paced and highly entertaining, and succeeds in handling some of its heavier going subject material with a very light touch. Which one of these films was directed by Cédric Klapisch?